Recommended for catarrhal conditions of the Upper Respiratory Tract, Sinusitis, Chronic Sneezing Hay Fever, Middle Ear Problems, Sore Throat,Mucous Phase of Measles, Common Cold, Inflammation of the Eyes including Conjunctivitis. 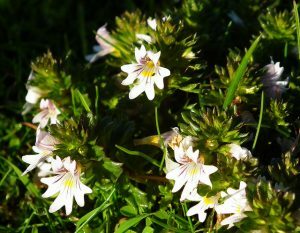 Eyebright has a long history of use for eye problems, hence its name. When used appropriately, eyebright will reduce inflammation in the eye caused by blepharitis (inflammation of the eyelash follicles) and conjunctivitis (inflammation or infection of the membrane lining the eyelids). It can be used as an eyewash, as eye drops, or plant infusions taken internally for ophthalmic use. It is used as an anti-inflammatory for hay fever, sinusitis, upper respiratory tract infections, and catarrh (inflammation of the mucous membranes). As an astringent, it is used for dry congestion. It also can be used for seasonal allergies and other nasal irritations. As an astringent, the herb is used to aid in the healing on skin wounds. It is made into a poultice and used on the wound topically. It can also be used to treat acne and aid in skin inflammation. Contraindications: Toxic symptoms can be experienced which include mental confusion and these can be anywhere from the range of 10 to 60 drops depending upon the individual.